Product prices and availability are accurate as of 2019-04-17 15:45:13 UTC and are subject to change. Any price and availability information displayed on http://www.amazon.com/ at the time of purchase will apply to the purchase of this product. The "Hastings" name from GemOro assures high quality! This 10X eye loupe features a distortion free, three piece, bonded lens made from Japanese optical glass. Color corrected with a working distance of one inch, this Matte Black finished loupe easily folds up to protect the lens when not in use. Includes leather carrying case. Size: 1" x 7/8" (folded). Why do I need this item? This is an essential item for viewing diamonds, gem stones or other small objects. The "Hastings" name from GemOro assures high quality! 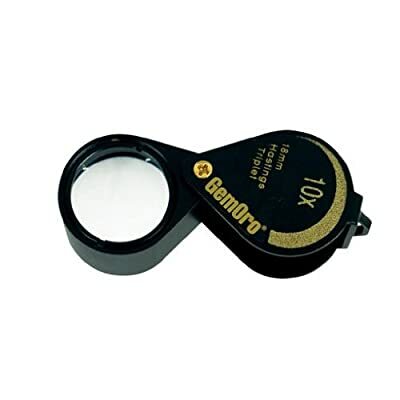 This 10X eye loupe features a distortion free, three piece, bonded lens made from Japanese optical glass. Color corrected with a working distance of one inch, this Matte Black finished loupe easily folds up to protect the lens when not in use. Includes leather carrying case. Size: 1" x 7/8" (folded). Lens diameter: 5/8" Magnification: 10X Why do I need this item? This is an essential item for viewing diamonds, gem stones or other small objects.